ke Solutions - ke Solutions web design project news and press releases - Internet of things: what does it have to do with my small business? Internet of things: what does it have to do with my small business? While a decade ago this concept was hard to grasp, most of us today can envisage the concept behind IoT with relative ease. After all, it is not difficult to imagine a world where most household appliances, transportation means, consumer goods, workplace appliances, etc communicate constantly among themselves; to some degree it is already happening with the appearance of the wearables and the integration of smart communication protocols into household appliances or cars on top of thoroughly established smartphones. This is what IoT is all about: the capacity of various things communicating directly among themselves in order to make increasingly smart decisions. 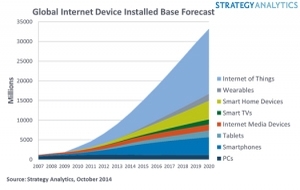 Where does the Internet of Things (IoT) comes from? IoT’s roots can be traced back to the Massachusetts Institute of Technology (MIT), from work at the Auto-ID Center. In the late ‘90s this group was looking for ways to create networked radio frequency identification (RFID). Wikipedia will tell you that RFID “is the wireless use of electromagnetic fields to transfer data, for the purposes of automatically identifying and tracking tags attached to objects”. Sounds to technical? How about that book you borrowed from the university library? Somewhere on the inside cover you may very well find a chip similar to the one you in the image above. A growing number of retailers use RFID chips on clothing items. Pets carry them as well... In short, RFID chips are part of our modern landscape for at at least a decade. Now, if you have RFIDs that you can stick to any number of things, why stop at tagging them only? Why not implement two way communication protocols? Then, they will start acting as sensors and information gathering devices and can become part of automated decision making. This how we get to the modern understanding of IoT. 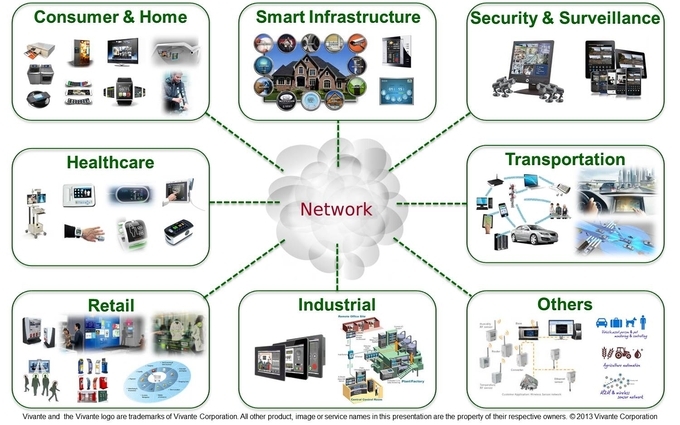 Since IOT is a fuzzy concept, I found this white paper published by Cisco Internet Business Solutions Group (IBSG) was quite right to define it as a point the point in history when more 'things or objects' were connected to the Internet than people. The number of devices connected to the Internet reached 12.5 billion in 2010, thus bringing the ratio of connected devices per person to 1.84, a number that we’ve since left behind on our way towards the predicted 4.3 connected devices per person by 2020. There are several problems IoT has to overcome in order to be the next stage in internet development: security issues, bandwidth issues, data integration issues. One of most urgent issues is the lack of internet protocol addresses. An IP address is a numerical label assigned to each device participating in a network. As the number of connected devices proliferates much faster than anticipated by the creators of the 32-bit IPv4 (the fourth version of the Internet protocol, introduced in 1981). By the end of the 90s, IPv6 was created, which has many more addresses available. Compare the 4 billion plus addresses available through IPv4 to the following (quite unpronounceable) number: 340,282,366,920,938,000,000,000,000,000,000,000,000. What does IoT entails for the average small business? Various sources mention advantages such as new business opportunities, efficiency when doing real-time operations and access to big data (provided solutions emerge to address the problem of integrating various datasets efficiently). The more you read about it the more you have the impression that such conclusions were written without any contact or experience with real-life small businesses; most of these predictions may actually hold some applicability for medium to large businesses, but it is doubtful they even speak the same language with a small scale company. So far for small businesses, IoT manifests itself as the drive towards mobile access: the need to be present and active on the mobile segment is increasingly a must. Even small businesses started to appreciate the need for creating their own mobile apps and making their sites responsive. While it is relatively clear that the IoT will bring change the good news for a small business is that these two requirements are all you need to do currently to stay on top and make sure your business is keeping up the pace.